Thank you. Thank you all for being here today. And while I’m thanking people—on behalf of ICI’s Board of Governors, let me extend a big thank-you to Stuart Parker for his leadership of this year’s General Membership Meeting. I think we can all agree that yesterday’s program was one of the best back-to-back line-ups that we’ve ever seen at GMM, and today the program promises to just get stronger. Stuart, you and your committee have done an awesome job of bringing this meeting together. This is ICI’s 60th General Membership Meeting. Our program is focused on the future, but we want to look at the future through the experience and wisdom of our long and well-documented past. So it’s in that spirit that I want to address a topic that I’m sure is on many people’s minds after some of the recent increased volatility we’ve seen in the markets. What’s the next big downturn in the markets going to bring…for stocks, for bonds, and most important, for stock and bond fund investors? Now…don’t get your hopes up. I’m not a forecaster or a prognosticator—neither Doctor Feelgood nor Doctor Doom. I’m not going to tell you what to short or where to go long. In fact, most of what I’m going to tell you is more related to this topic. Because what I want to talk about today are the myths that surround fund investors and their behavior. The factual history and the data that dispel those myths. And, most important, the key reasons why those myths are likely to remain just that—stories. I’m going to give you the case, based in lots of ICI’s well-respected data, to show how investors actually behave. Fund investors are prone to panic when the markets go against them. In their panic, fund investors force funds to dump securities onto the market at fire-sale prices. And so these alleged “runs” drive down the markets further…and undercut the stability of the entire financial system. These myths are nothing new. In the 1930s, Supreme Court Justice Louis Brandeis and others pushed the idea that investment companies helped cause the Crash of 1929 by dumping stocks onto the market. In our own time, we have had a run—of regulators pushing this same line. We’ve heard it from the US Financial Stability Oversight Council, the global Financial Stability Board, and all sorts of groups in between. To its credit, in its recent report the US Treasury stated clearly that stock and bond funds have not experienced industry-wide “runs” during times of financial distress. It’s a welcome turn toward the facts. Well, now we have 78 more years of history—and there’s still no evidence to support the myth that stock and bond fund investors act like lemmings. Time after time…cycle after cycle…we have seen huge reverses in stock and bond markets—and the response by fund investors has been far less exciting than the myth. In the bear market of 1973 and ’74, the S&P 500 fell by 42 percent. Over those two years, stock fund investors redeemed just 5.8 percent of those funds’ assets. In October 1987, the month of “Black Monday,” the S&P was down 22 percent. Outflows from stock funds were all of 3.2 percent of assets. During the financial crisis, from October 2007 to February 2009, the S&P lost more than half of its value. Yet stock fund outflows over that time were a mere 3.6 percent of assets. Then there’s Brexit. In the first two trading days after UK voters shocked the world, stocks lost $3 trillion in value worldwide. Yet for that week, ICI’s data show that global and international stock funds posted outflows of less than one-third of one percent. And when the tech bubble burst in 2000 and 2001…fund investors bought more stock funds. What kind of “run” is it when people bring more money? As he pointed out, “The very market action that would cause some holders to liquidate would cause others to hold or increase their investment.” Your “sell” signal might be my buying opportunity—or vice versa. ICI has demonstrated this with hard data. On February 5, the Dow Jones Industrial Average suffered its largest single-day point drop ever—down 1,175 points. And domestic-equity ETFs did have net redemptions in February. But domestic equity mutual funds were in fact buyers of stocks that month, to the tune of 8-and-a-half billion dollars. In net, fund redemptions accounted for just one-quarter of 1 percent of trading. Since 2013, when the Office of Financial Research issued its report on asset management, ICI has conducted a post mortem on investor behavior in every episode of turmoil that’s hit the stock or bond markets. 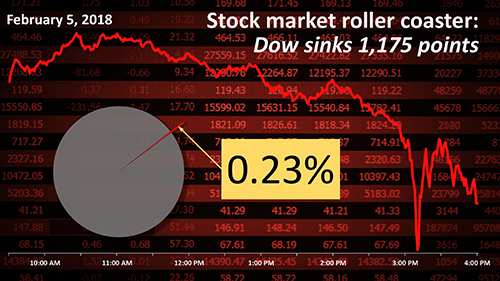 The Taper Tantrum…the flash crash…the high-yield bond breakdown in the fall of 2015 and the closure of the Third Avenue Focused Credit Fund…the Brexit vote…and February’s stock market volatility. Time and again, ICI’s data and analysis have shown that stock and bond fund investors don’t redeem en masse. Even when individual funds have large redemptions, total redemptions remain small. Asset sales by these funds account for a small fraction of market trading. And fund investors don’t drive the market during declines. Now you might say to me: Sure, Ted, you can point to almost a century of experience. You have reams of data on market breaks, back to Black Monday 30 years ago. And you can demonstrate that investors in stock and bond funds do not panic and don’tdump their fund shares into falling markets. But can you prove that fund investors won’t run next time? Can you guarantee that funds won’t tank the markets? “Next time could be different”—that’s the theme song for critics. Well, I told you before—I’m not a prophet. I can’t offer any guarantees. But I can tell you why fund investors haven’t panicked in the past…and why they’re not likely to do so in the next correction. And two—individual investors tend to be long-term investors. They are patient. ICI members report that 95 percent of the assets in stock and bond mutual funds are held by households—not by businesses or other institutions. More than 100 million Americans own mutual funds—and they overwhelmingly take the long view of their investments. Three-quarters of mutual fund–owning households say that saving for retirement is their primary reason for investing in funds. Another 5 percent say that they’re primarily saving for education. And 3 percent are saving for a house or big-ticket purchase. Taken together, more than four out of five fund investors are looking toward long-term goals—and looking beyond the daily bumps and dips in the markets. We can tell that these investors are willing to ride out market fluctuations by their behavior. ICI examined how 401(k) plan participants behaved in 2008 as they endured the second-worst year for stocks since 1825. Despite widespread reports that workers were abandoning 401(k)s, hard data show that 96 percent of plan participants stayed the course and kept contributing to their plans. And these investors tell us that they are indeed taking a long-term view. 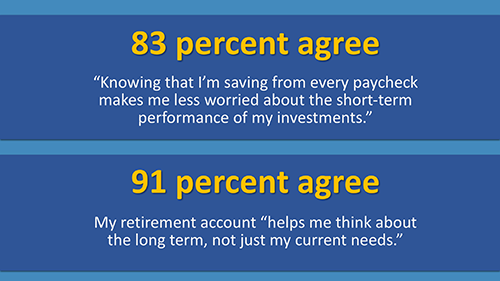 An ICI survey last December asked households that owned defined contribution plan accounts whether they felt that “knowing that I’m saving from every paycheck makes me less worried about the short-term performance of my investments.” Indeed they did—83 percent agreed with that statement. And an even larger number believe that having an employer-sponsored retirement account helps them “think about the long term, not just my current needs”—91 percent agreed. Now, skeptics might say that these attitudes indicate that fund investors don’t understand the risks of investing—or just ignore them. Again, let’s look to the evidence. The fact is, fund investors recognize investment risk—and accept it. About one-third of mutual fund–owning households tell ICI that they can accept substantial or above-average risk for the prospect of gaining substantial or above-average returns. And almost half say they’re game for average investment risks if they bring average returns. Put that together, and the vast majority of fund investors accept investment risk. They understand that assuming and managing risk is necessary if they want to reap the rewards of the market. Importantly, they also understand the difficulty of trying to time the market. Those with a long-term perspective know that they need to remain invested. And selling out of a bad market can mean just swapping one risk for another. Investors who sell all too often miss out when the market recovers. Research by JPMorgan Asset Management shows that $10,000 invested in the S&P 500 in 1998 would have been worth more than $40,000 by the end of 2017. But a market timer who missed just the 10 best days over those two decades would end up with only $20,000—half as much. 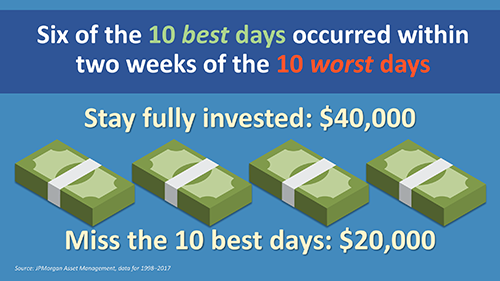 And here’s the real challenge for market timers: six of those 10 best days occurred within two weeks of one of the worst 10 days. Investors have gotten the message: ride out volatility and stay invested. Investors also have learned the risks of chasing hot performers. 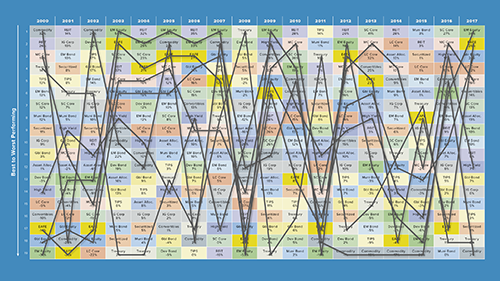 At Columbia Threadneedle, we call this “the periodic table”—it shows the relative performance of 19 asset classes, each represented by a particular color, across the past 18 years. If you spend a little time tracking each investment across time, you quickly figure out that winners don’t last—this year’s MVP can quickly become next year’s strike-out. So here’s another clear message: investors who build a diversified plan and stick with it are going to do better than those who chase returns. A good plan means you don’t panic when your hot pick goes cold. Well, fund investors aren’t in this alone. They have help. More than half of stock and bond fund assets are held in 401(k) or other defined contribution plans, or in individual retirement accounts. In DC plans, employers and plan administrators work hard to educate participants in principles of good investing—like not trying to time the market. And financial intermediaries play crucial roles. 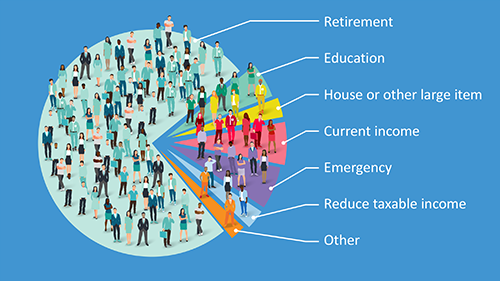 ICI research finds that about 80 percent of mutual fund–owning households who hold funds outside of retirement plans were guided by investment professionals. Financial professionals help investors set goals and design portfolios to meet them. And they help investors resist the urge to over-react to market conditions. A good investment professional can take the long view…bring perspective from past market cycles…and remind investors how their asset allocations were designed to meet their near- and long-term goals. In short, a professional can act like a stabilizer to help investors stay on course. And fund investors recognize the value of these relationships. ICI research finds that fund investors who work with intermediaries are more likely to be confident that they’ll hit their financial goals. When you’re confident in how your portfolio is positioned, you don’t worry as much about short-term setbacks. Let me shift gears here. One of the things I love the most about ICI…one of the great privileges of the position that I hold as chairman…is the opportunity to engage deeply with the wealth of data and expertise that the Institute has amassed over its 78-year history. ICI brings so much knowledge…so many facts…so much insight…to bear on policy issues, whether at the SEC, or on Capitol Hill, or in London or Brussels or Hong Kong or anywhere else around the world. ICI is committed to getting the facts and the law and the analysis right—wherever that may lead. This is one of the great strengths that our trade association provides on behalf of all of us…and to the benefit of the investors we serve. Because if there’s one thing I’m certain of, it’s that you can’t make good decisions based on bad information. You can’t start with a myth and end up with good policy. And you can’t serve the interests of investors—the common mission that we all share with our regulators—if you don’t take the time and effort to understand how they behave. So my message today: Let’s look at the facts—and let’s forget, forever, the myth of the panicky fund investors. Table 24 in www.ici.org/info/ret_17_q4_data.xls. 47% of all mutual fund assets are held in DC plans and IRAs; 53% of long-term mutual fund assets are held in DC plans and IRAs; and 13% of money market mutual fund assets are held in DC plans and IRAs. Year-end 2017 data.